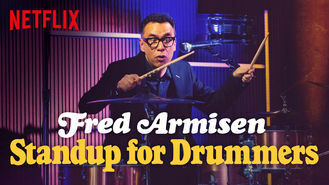 Fred Armisen: Standup For Drummers (2018) on Netflix Sweden. Check worldwide Netflix availability! If Fred Armisen: Standup For Drummers isn't available in your country, or you are visiting a country where it isn't, there is still a way to watch it! For an audience of drummers, comedian Fred Armisen shares and demonstrates his thoughts on musical genres, drummer quirks, regional accents and more. Behind the kit or up front with the mic, Fred commands the stage. And he clearly marches to the beat of his own drum.